Can Russia claim ‘victory’ in the Middle East? (Iraq Now News)- Russia’s President Vladimir Putin (R) meets with and Iraqi Kurdistan PM Nechirvan Barzani (L) on the sidelines of the St.
Petersburg International Economic Forum (SPIEF), Russia, June 2, 2017. The escalating Russian involvement in the Middle East in recent years has been characterised by the Kremlin’s signing of important bilateral defense and economic agreements with the region’s various conflicting parties – Syria, Iran, Iraq and Turkey, among others. With this strategic activism, the inheritor of the former Soviet empire appears to have strong-armed its way into the Middle East without tangible opposition or hindering by the United States. As the result of what can best be described as period of stagnant American policies in the region over most of the Obama administration’s eight-years in office, many of America’s major allies and partners in the Middle East have gone knocking on Moscow’s door, and continues to do so, to secure their economic and geostrategic interests. Consider just one example – that of America’s closest Middle Eastern ally, Israel: Russia has become an almost routine pilgrimage venue for prime minister Binyamin Netanyahu. With his last visit with President Putin in Sochi on August 23 to discuss Israel’s red-lines vis-à-vis Hezbollah and Iran in Syria, it was Netanyahu’s fourth such meeting with Russia’s autocratic ruler in the past 16 months. Although the Putin-Netanyahu channel remains highly confidential and personal, it is clear that Moscow is likely to play a role to some degree in ensuring that Israel’s strategic interests are addressed through Russia’s imposition of numerous tacit or informal limitations on Iran and Hezbollah’s military deployments, reach and activities in Syria. And regarding Syria, this writer knows from sources and insiders in Damascus that the Syrian president Bashar Al-Assad and his entourage are in reality only ‘props’: the real center for decision-making lies with the Russians, and that the word of a Russian military officer carries considerably more weight than any one of the senior officials of the Assad regime. The Russian supremacy in Syria is the price paid by the Assad regime to ensure its continued survival after more than six years of internal strife, outside involvement and civil war. On another front, Russia also regained and, indeed, increased its bilateral cooperation with Turkey after containing an almost war-threatening crisis caused by Turkey’s downing of a Russian fighter jet in November 2015. As a reflection of the growing Turkish-Russian ties, Russia has actively encouraged and supported Turkey’s involvement, along with Iran’s, in the Astana talks over Syria’s future. In yet another demonstration of Russia’s growing diplomatic clout in the Middle East, senior Iranian officials are now frequent visitors to Moscow to discuss and coordinate the two countries’ diplomacy and strategy in the region. The Syria file was one of the main topics in the talks held by Iranian president Hassan Rouhani during his visit to Moscow in March this year. Iran’s deputy foreign minister and its main representative at the Astana talks, Hussein Gabri Ansari, subsequently followed the (by now) well-worn trail to Moscow in early August. To further consolidate its foothold in the Middle East, Russia is also adroitly engaged in establishing bilateral political and security memorandums and understandings with many of the parties to the conflicts in the region. For example, Moscow, in pursuit of its goals, somewhat bizarrely hosted in August ‘Marshal’ Khalifa Hafater, commander of the so-called Libyan National Army, which is engaged in a brutal guerrilla war against the U.N.-backed government in Libya. And, the Iraqi vice president, widely viewed as an Iranian pawn, also paid a visit Moscow in July. 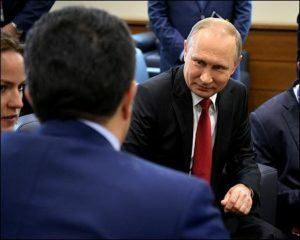 As for the Kurdistan Region, a landmark event happened in June, when the giant Russian state-owned oil and gas supplier Rosneft, and the Kurdistan Regional Government (KRG), signed a series of agreements on widening cooperation in exploration and production of hydrocarbons, commerce and logistics, as part of the XXI St.
Vladimir Putin met Nechirvan Barzani, the KRG prime minister, on the sidelines of the XXI St. In reality, Putin shrewdly lent prestige and moral support for the Kurds, given that they have suffered grievously from the impacts of the anti-ISIS war and financial crises over the past several years. Tellingly, Russia has also refused to react negatively to the forthcoming September 25 referendum on independence for Kurdistan. Russian foreign minister Sergey Lavrov said that the Kurds—like all other peoples in the world—had the right to express their national aspirations and that the referendum they had decided to hold was the means to do so. The United States, on the other hand, has officially stated that the timing of the referendum is not appropriate, and Rex Tillerson, the secretary of state, asked KRG president Massoud Barzani to postpone the planned referendum to ensure Iraq’s unity. The usual alternative peddled by Washington is for the Kurds to continue negotiations with Baghdad, which, incidentally, has proved futile. Worthwhile to mention here that the Kurds, having placed their faith and trust in America over the decades as their savior and guarantor, still hope the United States will finally come around to supporting Kurdish independence in deed over the coming year. As the part of its new strategy, it appears that Russia is not willing to lose to, or play second fiddle, to anyone – meaning the United States – in the Middle East region’s new great game. All parties to the various wars and conflicts roiling the region have shown desperation at various times to run to Moscow to ensure their security and strategic interests. But according to historical realities, the parties who are dealing or partnering with Russia – Israel, for example – must remain wary as Russia’s diplomacy and military involvement increasingly is ad hoc, contradictory at times and short-term. Russia historically is known for not being sincere or dependable for those relying on it. The new strategy that Russia is pursuing in the Middle East – bluntly speaking – is all about gaining power, geopolitical influence and overtaking the United States in the region. The Russians are playing checkers for keeps. The question is: will the United States under the Trump administration concede? Chiman Salih, a Kurdish legal consultant, writer, journalist and a contributing writer for Ekurd.net. Note: The post (Can Russia claim ‘victory’ in the Middle East?) appeared first on (Ekurd) and do not necessarily reflect the position of IraqNow.news.